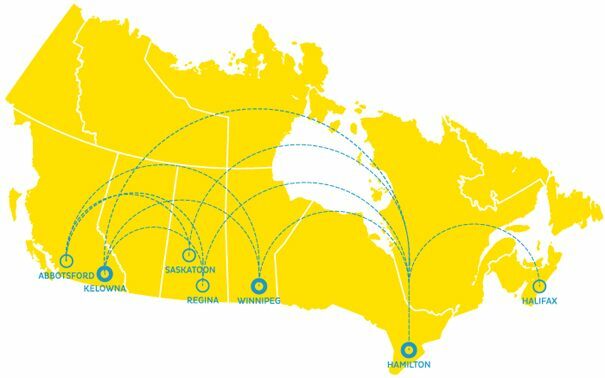 NewLeaf, Canada's new 'low-cost model' airline, has officially launched and they've released their route map, including flights to and from Abbotsford airport (YXX). Abbotsford airport is about a 1 hour drive from Vancouver, assuming the traffic is decent. To Regina or Saskatchewan, it's about 45% below the typical price of $325 roundtrip. To Winnipeg, it's about 40% below the typical price of $400 roundtrip. flight deals, canada, abbotsford, yxx, north america, regina, saskatchewan, yqr, newleaf, saskatoon, yxe, winnipeg, ywg and manitoba.